The document sets out in detail what is meant by "substantially all of the assets and liabilities primarily relating to the Devices & Services business", sets out what will happen if the transaction goes through, what will happen if the transaction does not go through, how the price for the business was determined and more. In a section that sets out the reasons for the sale of the Devices & Services business, Nokia notes the final decision was made at a meeting of Nokia's Board of Directors on September 2nd, after a thorough and careful assessment. This assessment, which included consultation with senior management and outside advisers, comprised an extensive strategic review of Nokia options. It is made clear that one of the material factors considered in the assessment was the option of terminating the existing agreement with Microsoft before the end of its term and instead adopting another smartphone platform. The document notes that while the agreement with Microsoft did not "fully restrict Nokia from developing and using other mobile operating systems" it did have "certain limitations as well as financial incentives to encourage Nokia to continue using Windows Phone as its primary smartphone platform". This is a reference to the platform support payments made by Microsoft to Nokia, which have been important in maintaining Nokia's financial stability, but it is notable that Nokia, financial considerations aside, could have opted to create devices using a platform other than Windows Phone. A number of other factors were also considered, but the key factor was that the Board and its advisers believed that the transaction provided the greatest value to shareholders and that the proposed sale price reflected a fair financial valuation. What's included in the Devices & Services business sale? This description includes all the key activities related to creating, designing, and making a modern mobile phone device. It includes all the key activities that are part of Nokia's Devices & Services business. This includes both device and accessory creation and design (e.g. device creation teams, design studios, and related technology teams, such as Nokia's highly regarded imaging team) and related software activities (e.g. silicon optimisation, mobile phone software, custom software on top of Windows Phone, services like Nokia Music and Nokia Store, developer relations, and more). 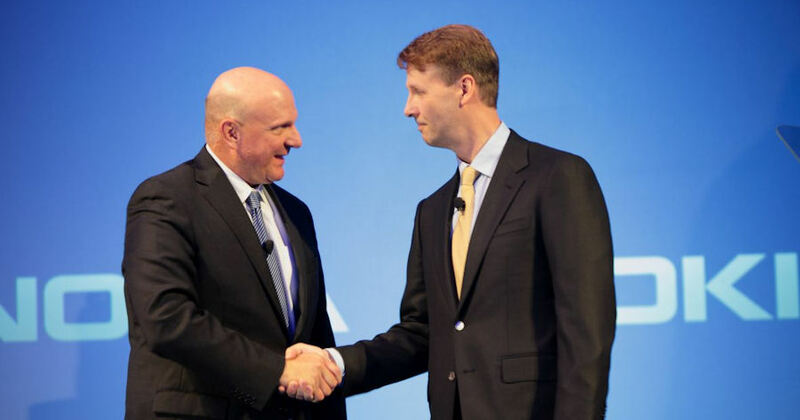 Nokia will also assign to Microsoft contracts that primarily relate to the Devices & Services business. Notably this includes a number of third party intellectual property agreements (e.g. patent licensing agreement with Qualcomm). We can assume this will also include support contracts related to Symbian devices and the ownership of the Symbian source code itself. The sale also includes assets primarily related to the Devices & Services business and related affiliates. This includes the leasehold interest in property and related objects, all intellectual property (other than patents and certain trademarks), and intellectual property licenses, other than patent licenses, related to the Devices & Services business. For example, this includes a number of Nokia hardware production and hardware testing facilities, the associated equipment, and the associated employees (of the 32,000 Nokia employees set to transfer to Microsoft, approximately 18,000 are involved in production). If the transaction does go through then the Devices & Services business will be sold to Microsoft, a 10 year patent agreement will be enacted, and Microsoft will become a strategic licensee of the HERE location platform. Nokia will continue to own and maintain the Nokia brand. Microsoft will have a 10 year license to use the Nokia brand on current and subsequently developed mobile phones based on Series 30 and Series 40. Nokia will be restricted from using the Nokia brand on its own mobile devices until December 31st 2015, and from licensing the brand for mobile phones for 30 months from the date of closing. However, if the transaction does not go through then Nokia will continue to conduct business "in the ordinary course" and will evaluate all "forward strategic alternatives". Nokia will be obligated to pay Microsoft a damage fee of €37.9 million if the transaction is blocked by its shareholders, and a further fee of €75.8 million, if 20% or more of the Devices & Services business is sold to a third party. In addition, the patent agreement will not become effective and Microsoft will not become a licensee of Nokia's HERE platform. If the transaction is terminated by Microsoft then Nokia will receive a payment of $750 million from Microsoft and Nokia will have the right to terminate the existing commercial agreement with Microsoft. The transaction is expected to be approved by shareholders at the November meeting. While there are likely to be a number of small shareholders that raise objections and vote against the board's recommendation based on their disagreement with the strategic direction of the company (i.e. not wanting to sell to Microsoft), institutional shareholders, controlling the majority of the shares in Nokia, are almost certain to vote in favour of the transaction, on the basis that it provides the best return for shareholders. It would be very unusual for a Board of Director-recommended proposal of this kind to be rejected by the shareholders. As part of its agreement with Microsoft, Nokia has undertaken that its employees and affiliates will not initiate or knowingly facilitate any proposals for a third party to acquire all or part of Nokia's Devices & Services business. This provision includes not disclosing non public information and not recommending a competing offer. This does not mean a third party cannot make a competing proposal, but it does make it more difficult for it to occur. In essence, Nokia is anointing Microsoft as the preferred acquirer for the Devices & Services business and making it more unlikely that there will be a competing offer. If a superior proposal to the Microsoft offer is made then Nokia is required to notify Microsoft and negotiate in good faith. It's worth noting that the competing proposal clause specifically excludes Nokia Siemens Networks, which theoretically would allow Nokia to spin off or sell NSN before the closing of the Microsoft transaction. One point that will attract substantial interest is that Stephen Elop will be receiving a significant payout, as laid out in an amendment to his contract that became effective when the transaction with Microsoft was announced. As previously disclosed, Elop resigned from his position as President and CEO and took a role as Executive Vice President of Devices & Services, which he will hold until the transaction with Microsoft is completed, after which he will become a Microsoft employee again. What's new are the details of the financial payout that Elop will receive. In total, Nokia estimates that this will amount to €18.8 million, consisting of base salary and incentive of €4.1 million, benefits of €0.1 million and equity awards of €14.6 million, with 30% of the cost borne by Nokia and 70% borne by Microsoft. While this is a handsome payout, it is worth noting that Elop's original contract provided for similar departure terms (18 months salary and accelerated vesting of equity awards). Both Risto Siilasmaa (interim CEO) and Timo Ihamuotila (interim President) are receiving additional compensation as result of their temporary new roles (€500,000 and €250,000 respectively). The proxy materials document also offers a summary of the nature of Nokia's business after the sales of the Devices & Services business. The Nokia Board of Directors will consider strategies for each of the businesses and "possible synergies between them" and the optimal corporate and capital structure after the closing of the Microsoft transaction. NSN is described as being a leader in mobile broadband and being focused on operating on the forefront of each generation of mobile technology, connecting people through LTE and future technologies. HERE is described as concentrating on growing its broad location offering across mobile devices, connected devices, enterprise solutions and automotive solutions. HERE will "continue to execute its strategy to become the leading independent location cloud platform company, offering mapping and location services across different screens and operating systems". Nokia's Advanced Technologies is set to explore new "business opportunities through advanced research, development and concept products in areas such as connectivity, sensing and material technologies, as well as web and cloud technologies". It will also seek to continue to build Nokia's patent portfolio and expand its licensing program.